The great Hungarian composer, Franz Liszt is most of the time only remembered as a superb piano virtuoso or as the composer who wrote solely for that instrument. It is very wrong to do so, as Liszt was also immensely active in the orchestral field, being the creator of the symphonic poem, which was to reach perfection with Richard Strauss. Liszt also composed two programme symphonies: 'Faust' after Goethe and Dante after the great Italian poet's memorable work. We are only concerned with the former works, as it was here that Liszt was to prove his mettle as a composer for orchestra. Liszt's first symphonic poem; 'Ce qu'on Entend sur la Montagne' was composed between 1847 and 1848 with the composer conducting the first performance at Weimar in February 1850. It is rather long (over 30 minutes) and is in fact sometimes referred to as 'Bergsinfonie'. Liszt took his subject from Victor Hugo's poem of the same name with the heady romanticism of the poem admirably captured by the music. The second, 'Tasso, Lamento e Trionfo' is based on Lord Byron's epic poem and can count as one of Liszt's most popular works. The composer conducted the first performance at Weimar in April 1854. The subject matter of the earthly disappointments and divine triumph was something that was to feature later in 'Mazeppa' and 'Hunnenslacht'. The next two symphonic poems, 'Les Préludes' after Alphonse de Lammartine and 'Orpheus' based on the famous Greek legend are the only two works that are played with any regularity in modern concerts. 'Les Préludes' is a showpiece for orchestra with several memorable themes (which have found their way into various modern television programmes) well constructed and very confident in its dramatic assertation. 'Orpheus' is completely different, a quiet piece depicting the Greek God with the harp used most delicately, this piece was a particular favorite of the English conductor, Sir Thomas Beecham. Both works were performed under Liszt's baton in 1854. The Fifth and Sixth symphonic poems bring together two famous legends, Prometheus and Mazeppa. Prometheus is filled with orchestral playing of great difficulty and can be counted as Liszt's most innovative work during the Weimar period. 'Mazeppa' is another work that is frequently heard, with the Polish legend aptly described by Liszt with even Mazeppa's fall from his horse described in orchestral terms. The composition is based on Victor Hugo's poem from 'Les Orientales' and was performed for the first time in April of 1854. The Seventh has no particular programme and is merely a succession of thematic motifs interwoven into a gigantic march. The Eighth, 'Héroïde funèbre' is another march though in completely different mood to 'Festklänge'. Here Liszt surpasses himself in composing a funeral elegy of great depth using dissonances which were well ahead of their time. Indeed many scholars believe that this is his greatest of all the tone poems. The Ninth, 'Hungaria' is another bombastic work without a set programme. It is sporadically based on Mihaly Vorosmarty's homage to Liszt recalling Hungary's great national heroes. This was the only symphonic poem to receive its' première in the composers native land (8th September 1856) an event which can count amongst Liszt's greatest artistic achievements. This brings us to the final quartet of tone-poems, probably unknown to most but of great musical importance nonetheless. The Tenth; 'Hamlet' is very mysterious and eerie depicting Shakespeare's classic plot to the full. Unfortunately, this work remained unperformed for several decades in its final form for it was first intended as an overture to a musical drama. The Eleventh, 'Hunnenslacht' (Battle of the Huns) is very similar to Mazeppa in its layout and storyline. Dealing with the exploits of the Hun; Attila it was inspired by Wilhelm Von Kaulbach's painting: 'The Battle on the Catalonia Plain' Incorporating the innovative use of the organ, it is a most exciting piece making it inconceivable that performances of this work remain extremely rare. It was premièred in December 1857 at Weimar. The final two symphonic poems contain no specific improvement on the previous ones but still have much to commend them. 'Die Ideale' is based on Schiller's poem of the same name and is the second longest of the tone poems at almost half an hour. From the Cradle to the Grave was inspired by Mihaly Zichy's drawing depicting the three main stages of life: Cradle, Fight for Existence and Death. Liszt split the tone poem into three movements played without a break remaining as faithful as possible to the drawing. With this composition, Liszt ceased his monumental cycle after almost forty years with the première of this work in 1882 in Rome. Record companies have been philistine in their attitude towards this epic cycle. 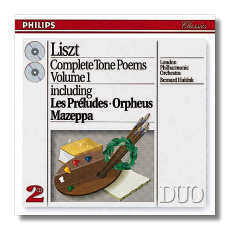 Several recordings of the more famous works such as: 'Les Préludes', Orpheus, Tasso and Mazeppa have been issued at regular intervals with the others almost unknown. 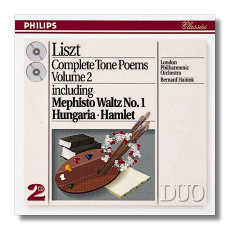 The only cycle of tone poems available at present is Bernard Haitink's with the London Philharmonic on two individual releases in the Philips Duo series (438751 - Amazon - UK - Germany - Canada - France - Japan & 438754 - Amazon - UK - Germany - Canada - France - Japan ). Still EMI plan to reissue their monumental late 1970's recordings of the complete orchestral works with the inimitable Gewandhaus Orchester Leipzig under Kurt Masur which should surely sweep the board in the Forte series. It is certainly an indispensable part of the Liszt discography and should hopefully make these works more accessible to the current music lover.